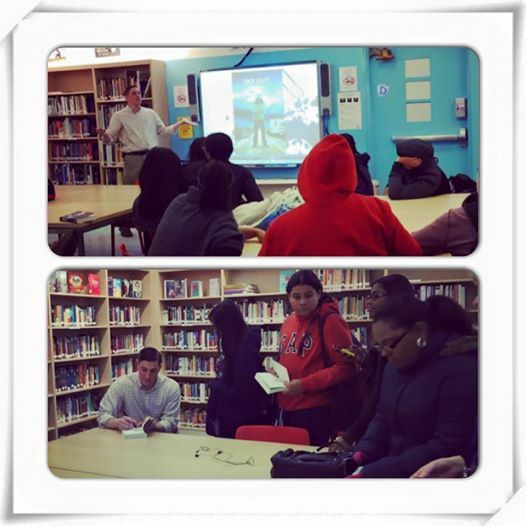 I was there through the Author Adopt-A-School program to present on my work––Press Play, in particular––and explain how I transformed from someone, who as a teen, enjoyed reading and writing, to someone who now writes novels for teens. However, a large part of me, whenever I present at a school, is also there as the teacher I am as well. And so, in spite of the kind remarks I’d heard, it was with trepidation that I met classes during the last two periods of the day. On a Friday. The first week of school after a two-week Christmas break. Yeah, the deck was stacked against me. During the presentation, they seemed to love my back story, of how I sprinted from grad school to marriage to parenthood and yet kept writing. They shook their heads at the ridiculousness of my experience of being rejected so many times, and revising so many pages to then not sell anything. And they truly enjoyed the personal stories of how each of my books came to be. So, yes, an absolute success. And I couldn’t be happier to have been a part of such an excellent program. The perks of being an author are not contained within pages; they are very much about everything that happens in the real world, because of the gift I’ve been given to have my words in others’ hands. Thanks, again, Park East, for making feel so welcome, and for reinforcing the love I have for what I do. Happy reading.